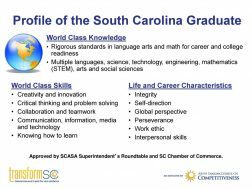 The South Carolina Council on Competitiveness was created in 2004 by a group of business and civic leaders in response to an analysis of the state’s economy by a world-renowned expert in economic competitiveness. 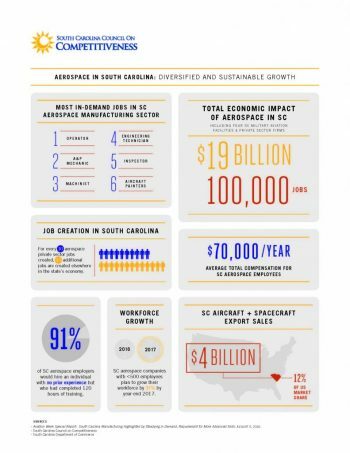 According to two new studies released at the SC Aerospace Conference & Expo, South Carolina’s aerospace industry continues to drive economic growth. 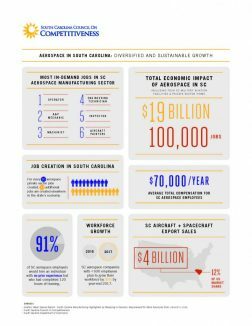 An economic impact study released by the South Carolina Council on Competitiveness shows that the impact of aerospace on South Carolina’s economy has grown to $19 billion, an increase of $2 billion since last measured in 2014. One page infographic summarizing findings of Dr. Joesph Von Nessen’s analysis of 2012 NETS data. For the full presentation, click here. 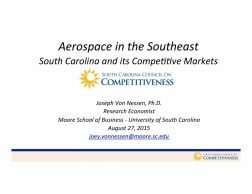 An analysis comparing South Carolina’s aerospace cluster to those in Washington, Georgia, Alabama and North Carolina using the latest available NETS data (2012). The term “infrastructure” is well understood to refer to the basic, underlying foundation of our built environment: roads and bridges, water and wastewater, power, communication, etc. The most important component of our economic infrastructure is the Transportation, Distribution and Logistics (TDL) cluster which forms the very foundation of South Carolina’s economy. Each day in South Carolina, a child misses a chance that may never come again. Whether she lives along the back roads of the Midlands, or in splendor along the coast, or in the hill country of the Upstate, it makes no difference. A missed chance cannot be replaced. “Workforce development.” It is a phrase you hear often when people are talking about competitiveness and economic development, but what does it really mean? Workforce development is all about people. It is about bringing to the economic development table the human resources that a state, a company, or an economic cluster needs to succeed. South Carolina, like many Southern states, is faced with the loss of her traditional economic base and a shortage of workers prepared for the jobs of the twenty-first century. 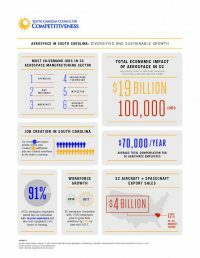 For nearly three hundred years, South Carolina’s economy has depended upon the low wages that characterize agriculture, textiles and tourism industries. The aerospace cluster has experienced one of the highest growth rates in employment among all industries in South Carolina over the last decade. 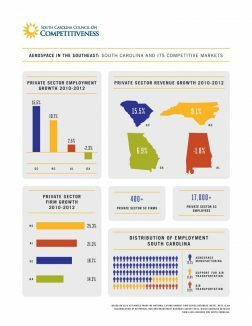 From 2002 to 2012, annual employment growth in the aerospace cluster averaged 4.2 percent, compared to just 0.3 percent for the state as a whole.